Ice hockey players may think they face a tough schedule these days but the generations who skated before them kept going well into summer. In the 1970s, Fife Flyers would routinely wrap up their seasons in mid-May. Season 1978-79 saw them keep playing after Kirkcaldy Ice Rink had closed, forcing them to take their last home games north to Aviemore! The season featured a team based around local talent, but with the addition of one of the handful of imports who iced in that decade. Doug Weswater was living with family in Perth – his dad played for St Johnstone – when he rolled up for a try-out and impressed player-coach Lawrie Lovell. Westwater had skated in Ontario, playing Junior B hockey with Bradford Airgun Penguins, and Peterborough Petes, the kingpins of the Junior A scene. He came on board mid-season, stepping into a campaign which saw Sunderland-based Crowtree Chiefs make their debut in the NIHA. Flyers were led by team captain, Kenny Horne, and they hit the ice for an opening game which drew a crowd of 2000, and ended in a 9-4 defeat to Murrayfield Racers. Hat-tricks from Chic Cottrell and Ally Brennan got them off the boards with a 14-4 thumping of Glasgow Dynamos, followed by an 11-5 pasting of Billingham Bombers. They then headed across the Forth to face old rivals Racers in front of the biggest crowd of the season, going down 7-1. They quickly hit a winning streak, brushing past Crowtree (9-3), and then chalking up a four-point weekend in the north-east, defeating Whitley Warriors 5-3, and Durham wasps 10-5. Charlie Kinmond took top billing with a four-goal haul in an 11-4 victory over Ayr Bruins as Westwater made his debut. December saw the wins continue to come. With the team playing with confidence, Flyers threw up young netminder Roddy Grant in a 12-8 road win at Ayr. The west coast side were 6-1 up before Fife flicked the switch and went into period three just one goal in arrears. An eight-game winning streak took them through Christmas as utility player John Taylor hung up his skates, just one game short of 300 appearances. The man known to all as ‘Slack’ had given sterling service across 13 years. Ayr were blitzed 17-5 – Kinmond got four, Jimmy Jack a hat-trick – before a unique challenge game saw Flyers take on a Reserve League team for the very first time. It was a handicap event, with Fife giving the opposition – made up of players from Kirkcaldy Kestrels, Murrayfield Raiders and Tayside Tigers – a nine-goal start. It sparked huge interest across the NIHA, and Flyers quickly emphasis ed the gap, winning the game 17-13, with Chic netting no fewer than six goals. Crowtree made their Kirkcaldy debut, and it was painful – they were thumped 18-4. A depleted Fife side then went down 9-6 to Billingham in the Spring Cup semi-final first leg before Lovell returned and took his NIHA career points to 1300 in a 5-3 Skol Cup tie victory over Glasgow. A hat-trick then followed in a 13-5 defeat of Ayr. In pursuit of silverware, Flyers booked their place in the Icy Smith Cup final with a contentious 3-2 win over Glasgow. Lovell and Gordon Latto netted four piece in a 14-6 win over Billingham to secure a place in the Spring Cup final – they lost out to Racers – and there was defeat in the Icy Smith as Murrayfield won 5-2 after a delayed start. 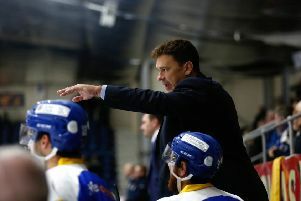 Fife refused to take part in a dispute over the referees who had resigned from the NIHA earlier that day. The face-off was delayed for some 35 minutes, and a large crowd made to wait before Flyers agreed to skate under protest. By now it was April, and there was still hockey to play. A special challenge game against touring side Niagra Falls South proved to be hugely one-sided as Fife skated to a 16-1 victory in front of a big crowd. The visitors turned out to have an average age of 42, and the game was played under old-timers’ rules – no slapshots or bodychecks, leaving the crowd with little to get excited about. Guesting for Flyers, Jack Dryburgh netted a hat-trick. The calendar flipped to May before Fife secured silverware. Racers were chasing a Grand Slam and took a 4-3 lead into the second leg of the Autumn Cup final – a game which saw two incidents with former Fife goalie John Pullar. Kenny Horne was handed a ten-minute misconduct for throwing the goalie’s stick into the crowd, and then Kinmond collided with Pullar, and they were still having an altercation as Law Lovell hit the empty net to tie the game! By the time the second leg came round, Kirkcaldy’s rink had closed, forcing Flyers to find ice in Aviemore. The long journey north to a town with a great hockey story of its own was more than worth it as they won 12-4. The perfect way to draw the curtain on any campaign.